Glenn Close is known for her countless roles as an actress in film, television and on stage over the years. She has been recognized for her work with Academy Award nominations, Emmy, Golden Globe and Tony Awards. She is beloved by her fans and respected by her peers. With all of her accolades, it would be easy to simply recognize her incredible accomplishments in the industry, but we wanted to go further into Glenn’s life to educate you on an issue very near and dear to her heart: mental illness. 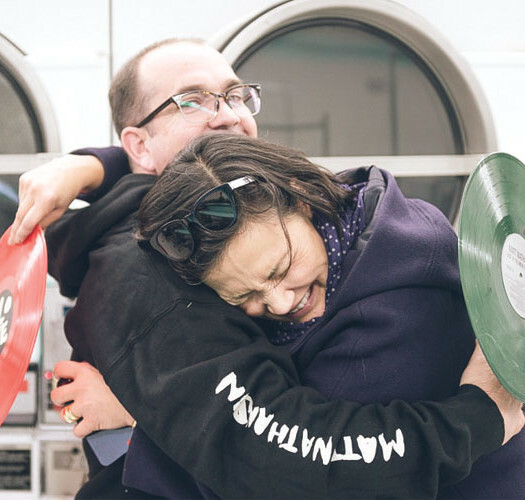 Glenn’s life’s work is not just performing; she is using her voice in a global setting to start a conversation to end the stigma and discrimination of mental illness, and she is doing so with the nonprofit organization she Co-Founded, Bring Change 2 Mind. Within this article and with the help of interviews from Glenn Close, her sister, Jessie Close, her nephew, Calen Pick and Pamela Harrington, Executive Director of Bring Change 2 Mind, we are introducing the topic of mental illness for two specific reasons - one, to say that it’s okay talk about it, and two, to share how important it is to understand what it is and what it isn’t. 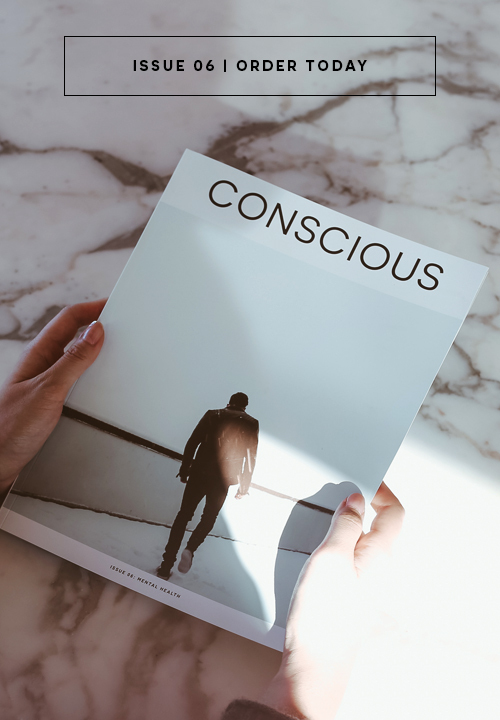 Like many of our other Conscious articles, we want you to walk away with knowledge, and in this case the tools to support those struggling with mental illness, so you can make a difference in their lives and also to recognize the signs of a mental health concern. As Pamela Harrington (Executive Director at Bring Change 2 Mind) said, “one in four individuals have a diagnosable mental illness at some point in their lives.” It is very likely that someone we know is living with a mental illness, and due to their fear of discrimination, they may avoid seeking help. “Mental health conditions can affect anyone. It cuts across demographics, income levels, ethnicities, and all other aspects of life. We need to educate ourselves about mental health conditions and know that with early intervention and treatment, recovery is possible,” said Pamela Harrington. While we may have heard the different types of mental illnesses like Bipolar Disorder, Depression, PTSD, Schizophrenia, Schizoaffective Disorder, Borderline Personality Disorder, etc. however, we may never fully have taken the time to understand the facts, and so I encourage you to read the facts and myths surrounding mental illness by visiting Bring Change 2 Mind. Special thanks to Glenn Close and the team behind Bring Change 2 Mind for starting this conversation. Glenn Close, Co-Founder and Chair of Bring Change 2 Mind, talked to Conscious to share why this mission is important to her, along with some of her family’s stories and their struggles. During our interview, I could hear the sincerity and the seriousness in Glenn Close’s voice, which made the interview that much more meaningful, as I know Glenn spoke from her heart and showed her courage to address this issue. RELATED: *Interviews with Jessie Close (Glenn Close’s sister) and Calen Close (Glenn Close’s nephew). During my time with Glenn Close, I was honest about mental illness in my own family, and how we had experienced it when it came to my Dad. I explained to Glenn that he had a struggle with drugs and alcohol, but at the time, I didn’t understand that he also suffered from a mental illness. I explained that I was afraid to get close to him. Ms. Close assured me many people feel that way, but that is part of the stigma that we must overcome. 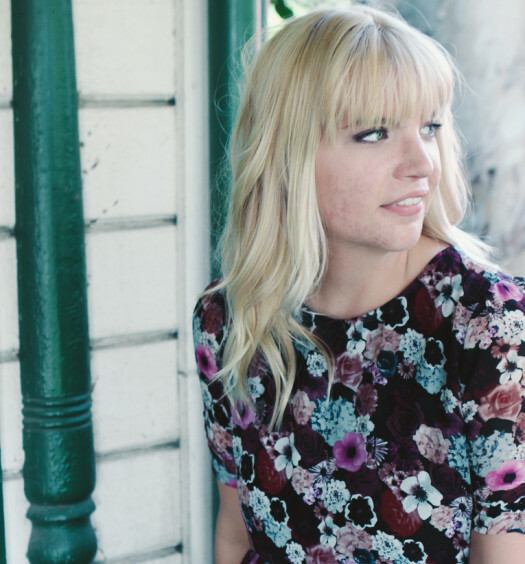 1 | Rachael Baxter: Why is ending the stigma and discrimination of mental illness important to you? Glenn Close: Mental illness is in my family, and it has wreaked havoc on members of my family in ways I wasn’t initially aware of. At the time, no one ever really talked about it, and if my family had talked about it, then maybe some people might still be alive. Jessie, my sister, lives with bipolar disorder, and Calen, my nephew, lives with schizoaffective disorder. At the time, I was clueless, and I didn’t know what was going on. I was shocked to learn of their day-to-day challenges and how isolated they felt. My sister first tried to commit suicide at 16, and then again at 19. In our family, Jessie was seen as the wild one, and so our family just thought she needed to get herself together, which is why she went undiagnosed for so long. We are lucky she is still here. Our story is like many millions of other families with mental illness. We didn’t know about it and now we do. The support and love that family and friends can give to someone is vital to their recovery and another huge part of recovery is to come out and talk about it. The non-profit, Bring Change 2 Mind, became my main focus four years ago. Jessie, Calen, and I jumped into it together. I wouldn’t have done it without them. 2 | RB: Not in all cases, but for most people when they know someone has mental challenges, we can sometimes write them off and say, “That's not my problem. They need help.” How can we alter this perspective and become part of the solution? How can we take responsibility in serving and helping those with mental illness challenges? GC: Self-stigma is a huge problem, and so we need to be empathetic. Don’t isolate those with mental illness. They are not their illness. There is a human being there with feelings, dreams, and desires. Include them and learn about their illness. If you say the scary words: bipolar disorder, borderline personality, serious depression, and then educate yourself you are showing that you are going a long way in helping others with disorders and they will be encouraged. Ultimately, our society (as a whole) needs to realize the wealth of talent that is there in the community living with mental illness, and so our society needs to invest in these people - not ignore them. 3 | RB: Many of our readers are based in New York City and come into contact with people from all walks of life. Unfortunately, there are many homeless people who do out of the ordinary things, and then approach a New Yorker for money. Most of the time, people say "no" for reasons of: they can help themselves, they have a drinking and drug problem, etc. But, a lot of the time, homeless people struggle with mental illnesses. How can we, as New Yorkers, handle these situations better? GC: Addiction is considered a mental disorder as well. For this question, I asked Dr. Lloyd Sederer, former head of mental health for the State of NY to guide me. Dr. Sederer said there two types of people on the street - (1) pan handlers - some they make it their career, and then (2) the people with drug / alcohol abuse and mental illness, so they become chronic people on the street. He said the best thing to do for someone in need is instead of giving money, invite them into the shop and buy them a sandwich. You can also call 311 and report a homeless individual. Many times homeless individuals do not go to the shelters because the shelters? are dangerous. By calling 311, you will be directed to an outreach center, which will also provide the tools and the knowledge for situations like these. 4 | RB:. How can we as individuals be more sensitive or more aware of those that have challenges with mental illness? What are the signs? How can we be more educated about the situation? GC: First, there are many places you can educate yourself. For example, NAMI, the National Alliance on Mental Illness, is the nation’s largest grassroots mental health organization dedicated to building better lives for the millions of Americans affected by mental illness. NAMI advocates for access to services, treatment, supports and research and is steadfast in its commitment to raising awareness and building a community of hope for all of those in need. 5 | RB: What are ways our readers can support BC2M? GC: We are in our adolescent stage at Bring Change 2 Mind. There is so much to do, and there aren’t many of us on the administrative side. We want to stay very effective, and we are interested in partnering and creating messaging with people that are scientifically based. We invite you to become part of our community. Take the pledge and support - even if that means donating $5. All of your support will be put to very focused use in creating Public Service Announcements that are changing stigmatizing behavior in our population. The fact is, mental illness is prevalent all around us. Pamela Harrington, Executive Director of Bring Change 2 Mind, pointed out that we can see the signs of someone struggling with mental illness and that the person may be a friend, a co-worker, a neighbor in your life, etc. When you recognize that someone’s behavior changes drastically and they begin to withdraw, there could be a problem. At this point in time, we have the opportunity to open the dialogue by simply talking to one another and sharing stories. The next step is to help them seek effective treatment and begin the road to recovery..
First, take the Bring Change 2 Mind pledge. The fear of stigma and discrimination can have a devastating effect on those living with mental illness. Change happens one person at a time. If you are living with a mental illness, know someone who is, or just want to help, take the pledge to help end stigma. Read the full pledge here. Second, educate yourself. A new program, Mental Health First Aid (Mentalhealthfirstaid.org), is available across the country. You can sign-up for a day long training class where you’ll learn about mental health conditions and be given effective tools in how to help in your community. By having this knowledge, you’ll become sensitive to adults and kids isolating themselves, be taught to recognize behavioral changes, and help to end the misconceptions that surround mental illness. This is going to take the involvement of our entire community. We need to become responsible members of our society in this incredible country, as we owe it to our children and the health of our nation. Third, have a conversation with the employee assistance program at your company. If you, or someone you know, is struggling with mental illness, then use the resources of Bring Change 2 Mind and realize you are not alone. 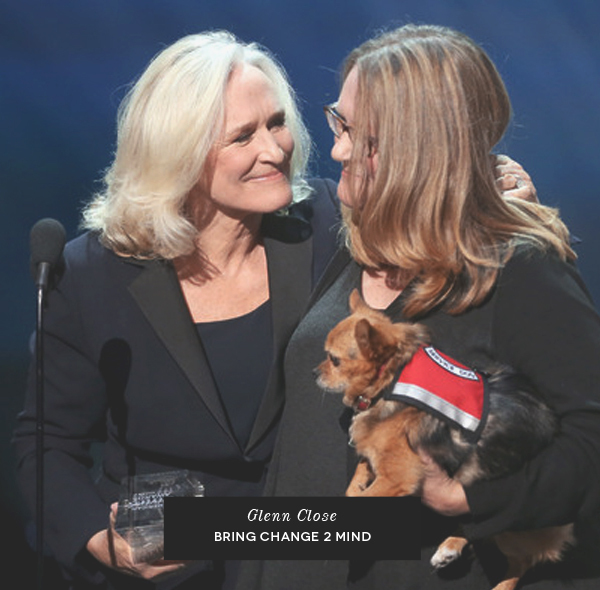 Bring Change 2 Mind is a national anti-stigma campaign founded by Glenn Close, The Balanced Mind Foundation, Fountain House, and Garen & Shari Staglin of the International Mental Health Research Organization (IMHRO), aimed at removing misconceptions about mental illness. The idea was born out of a partnership between Glenn Close and Fountain House, where Glenn volunteered in order to learn more about mental illness, which both her sister, Jessie Close, and nephew, Calen Pick, live with. Great piece. Glenn was also featured in a documentary created by a friend (http://www.hiddenpicturesfilm.com/) and it brought so many hidden issues to light. Thanks for another eye-opening piece on the subject! It’s a shame that Glenn Close has come to this realization “after” she portrayed people with mental illness in the movies as if they were “psychos” rather than depicting them with compassion and breaking down stereotypes. Over 90% of people with mental illness never act out violently!!! The same thing needs to be done for anxiety to. It is not a serious mental illness, but so many people don’t understand it either. Mental illness has also affected several of our family members, which means it has affected us all. These relatives are still the reason we get up every day, still favorite son, daughter, grandmother, auntie, sister or brother we have always loved. This does not make us love them less. Thank you for speaking up! I think this is a wonderful foundation, and they have my support. It will be a good day when our society accepts mental illness and wants to further research and find cures like they do cancer, MS, MD, and other illnesses. I have shared my Grandmother’s story with them, how Blind Contour Drawing cured her 40+ year depression when electric shock treatments, medicines and counseling were only temporary fixes. You can read about her story at http://www.elizabethlayton.com. Help comes in many forms, and you never know what you can do to help until you reach out.